This past December, the legendary Sum 41 teased two new songs on their Instagram. Now, frontman Deryck Whibley has taken to Facebook to check in with fans eagerly awaiting the new album. Read his statement below. “as the year comes to an end, i can honestly say that 2015 has been one of the best years of my life. it has been a year of accomplishments. learning to walk again and getting back on stage were some of the hardest things that i’ve ever had to do. getting my life back on track and my health in order, while at the same time making a new Sum 41 album, almost seemed impossible this time last year, but now the record is almost done and i feel stronger and better than ever. the band is sounding bigger and better as a 5-piece, and it’s so great to have dave 'brown sound' back again after almost 10 years. 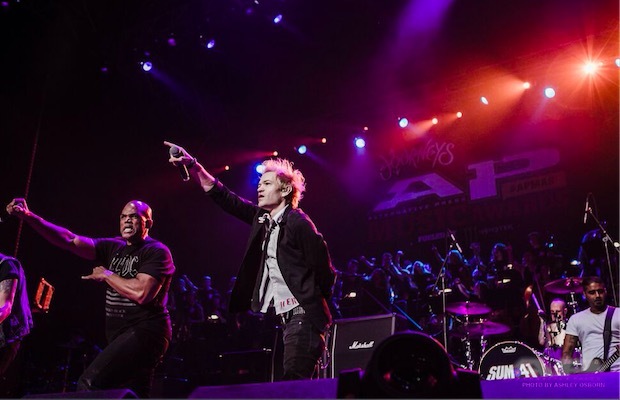 the Alternative Press awards performance with DMC was one of the best experiences in our career and the shows in North and South America were all amazing. it’s hard to believe that 2016 is going to be an even bigger year – i can’t wait! thanks for all the love and support and we’ll see you all in the new year! 2016 is shaping up to be a great year for new releases from the likes of Pierce The Veil, Beartooth, Real Friends and, of course, Sum 41. Which one are you most looking forward to? Let us know in the comments.